Natural events caused by different weather conditions such as floods and fires often occur in some countries in Asia, such as in the Philippines and Australia, which strains the traditional copper infrastructure networks. When disasters and natural calamities happen, downtime occurs, resulting to most of the organizations or companies not functioning to the fullest, which greatly affects their productivity. There are ways on how to reduce the risk of weather damage on your network. One way that is very effective and popular nowadays is to switch to fiber optics. Fiber optics is much more reliable than your traditional copper wires. Fiber Optics is today’s widely used method of telecommunications by transmitting information from one place to another in form of light pulses going through a transparent fiber strand of either glass or plastic. So, it is just fitting that in order for you and your company to achieve an increase in productivity and profit, you should switch to a fiber optic network. Fiber optics is dominating and surely satisfying people around the world. In addition to that, people are strongly considering fiber optic technician training because jobs are opening all thanks to fiber optics. But we are here to discuss why fiber optics is the best solution for a weatherproof internet. The environment always has a say in everything, even in the world of fiber optic network connection. Reliable and resistant, fiber optic cables can withstand any type of natural calamity, when protected and installed properly with the help of a Certified Fiber Optic Technician. It’s important to choose the right technician, one that is FOA certified for they have all the knowledge pertaining to fiber optics and how it can be most utilized. The first thing you need to know about fiber optic technology is that it is made from glass, which is different from the traditional copper cable made from metal in the transmission of data and electricity. Copper cables are vulnerable to corrosion, breaking in cold or hot temperatures, rain and lightning, that results in short-circuiting and signal interference, which leads to lost connection and major company downtime. Plus, fiber optic cables have a larger bandwidth, which means more data are transmitted in a short amount of time. 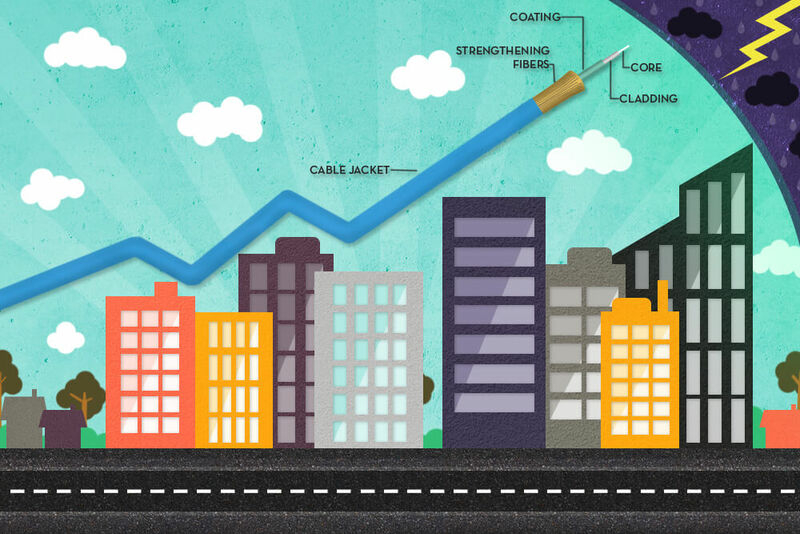 Fiber optic cabling has a much stronger insulation system and will not attract lightning compared to traditional copper cable. This feature makes it more capable of surviving a heavy storm or dynamic weather conditions. Unlike using copper wires, strong winds can damage them easily by knocking out power lines, which causes ground heaves, tearing apart copper lines buried in the ground. During rainy seasons, rain and flood may leak its way into copper wirings, pipe infrastructures and filling pits. With the storm water affecting signal strength permanently, which may lead to temporary downtime in your business, consider immediately going with fiber optics. Fiber is more durable than copper and less vulnerable to leakages with its protective coating that copper wires don’t have. Nowadays, strong, fast and reliable internet connection is everything to all businesses. Fiber Optic Network will reduce your operational and company expenses, which really enhances the productivity goals of your company. And one more thing, fiber communications system is ten times faster than copper, which grows rapidly with technological advancements and its sustainability in different environments and more scalable to starting and growing business. Nexus-net has the best technicians to install and integrate cutting-edge fiber-optic technology, giving you the best communications experience, which will ensure to help your business attain its desired goals and mission in the long run.